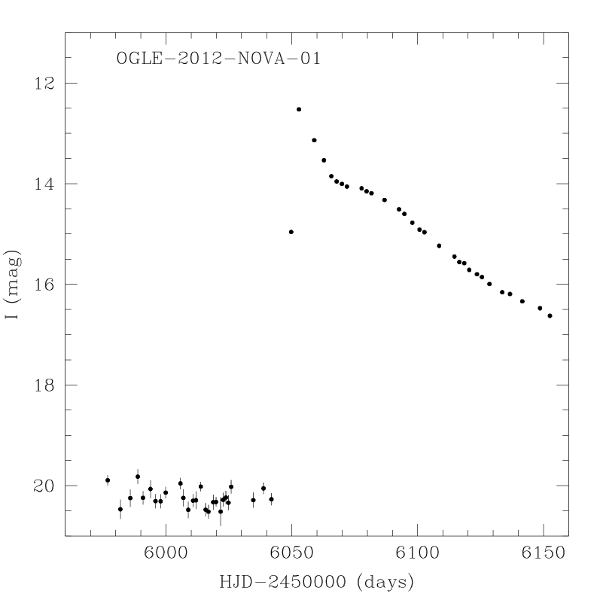 We report the discovery of a relatively bright (I=12.5 mag near the peak) possible classical nova (OGLE-2012-NOVA-01) in the database of new objects from the fourth phase of the OGLE survey (OGLE-IV). The nova does not have a detectable progenitor in the OGLE-IV I-band images before 2012 May 2, meaning it was fainter than I>20.2 mag. Its brightness rose fast after 2012 April 24 reaching I=14.96 mag on 2012 May 2 and peaking on 2012 May 5 with I=12.53 mag. We then observed a slow magnitude decline, reaching approximately I=17 mag as of 2012 August 20. Location of the nova is (RA, Dec) = (17:56:49.39, -27:13:28.2) J2000, 1 arcsec from a faint I=18.99 mag star, that securely is not the progenitor. North is up, East is to the left, 1 pixel=0.26 arcsec. There exist three OGLE-IV V-band images from 2012 season for this field. Only the third one, taken on 2012 July 25 (HJD=2456133.654162), was recorded during the eruption but we find no detection of the nova at the level of V>21.2 mag. This corresponds to the color of (V-I)>~5.1 mag or the extinction corrected color of (V-I)>~1.6 mag (see below). Both analysis of the CMD and magnitude histograms for this field showed no presence of the red clump giant stars. We are unable to determine the extinction for this field from the OGLE data alone, but it must be higher than AI>2.6 mag (the nearest OGLE-III field with determined extinction; Nataf et al. 2012, arXiv:1208.1263). Using the VVV extinction map (Gonzalez et al., 2011, A&A, 534, 3 and Gonzalez et al., 2012, A&A, 543, 13), we find extinctions in V- and I-band to be AV=6.8 mag and AI=3.3 mag assuming the standard interstellar extinction law with RV=3.1. This amount of extinction shifts the red clump giant stars to V=~22.1 mag, i.e., below the OGLE-IV detection limit. The I-band extinction corrected near peak magnitude would be then I=9.2 mag, what corresponds approximately to the absolute magnitude of MI=-5.3 mag assuming the nova exploding in the Galactic bulge (at 8 kpc). The I-band photometry for this object is available to download from the OGLE Internet archive.